It turns out that when you search Google for the phrase 4D pie chart, this blog is only the second link. The number one spot is taken by a tutorial on how to create animated pie charts with Maxon Computer’s Cinema 4D package. I can’t detect any hint of sarcasm in the instructions. Hang your head in shame, Maxon Computer employee. Last week I was shown the results of a workplace happiness questionnaire. There’s a cut down version of the dataset here, with numbers and wording changed to protect the not-so-innocent. The plots were ripe for a makeover. The ones I saw were 2nd hand photocopies, but I’ve tried to recreate their full glory as closely as possible. To the creator’s credit, they have at least picked the correct plot-type: a stacked bar chart is infinitely preferable to a pie chart. That said, there’s a lot of work to be done. Most obviously, the pointless 3D effect needs removing, and the colour scheme is badly chosen. Rainbow style colour schemes that change hues are best suited to unordered categorical variables. If you have some sense of ordering to the variable then a sequential scale is more appropriate. That means keeping the hue fixed and either scaling from light to dark, or from grey to a saturated colour. In this case, we have ordering and also a midpoint – the “neutral” response. That means that we should use a diverging scale (where saturation or brightness increases as you move farther from the mid-point). On balance, are people happy? Which questions indicate the biggest problems? Which sections indicate the biggest problems? Since the scoring system is slightly arbitrary, it is best practise to check your results under a different scoring system. Perhaps you think that the “strongly” responses should be more heavily weighted, in which case a quadratic scoring system would be appropriate. (Replace the weights 1:3 with (1:3)^2/2.) Assume the data is stored in the data frame dfr. 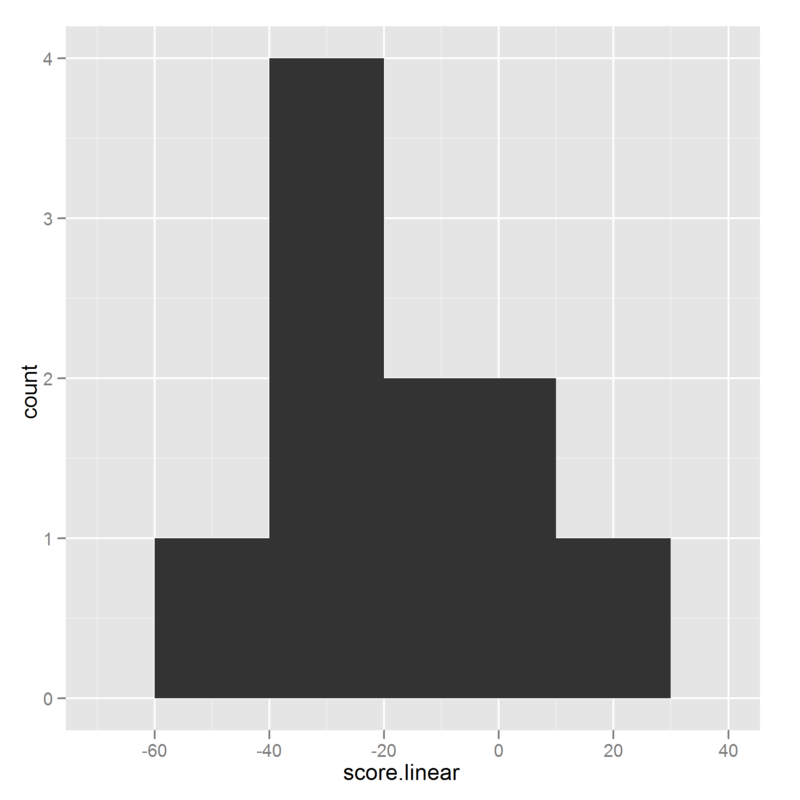 For the rest of this post, I’ll just present results and code for the linear scoring system. Switch the word “linear” with “quad” to see the alternative results. To get an ordering from “worst” to “best”, we order by -score.linear. To make the data frame suitable for plotting with ggplot, we reshape it from wide to long format. To answer the first question, we simply take a histogram of the score, and see if they are mostly above or below zero. Hmm, not good. Most of the questions had a negative score, implying that the workforce seems unhappy. Now we want to know why they are unhappy. Here are the cleaned up versions of those stacked bar charts again. As well as the style improvements mentioned above, we plot all the questions together, and in order of increasing score (so the problem questions are the first things you read). So deaf managers are the biggest issue. Finally, it can be useful to know if which of the sections scored badly, to find more general problem areas. First we find the mean score by section. 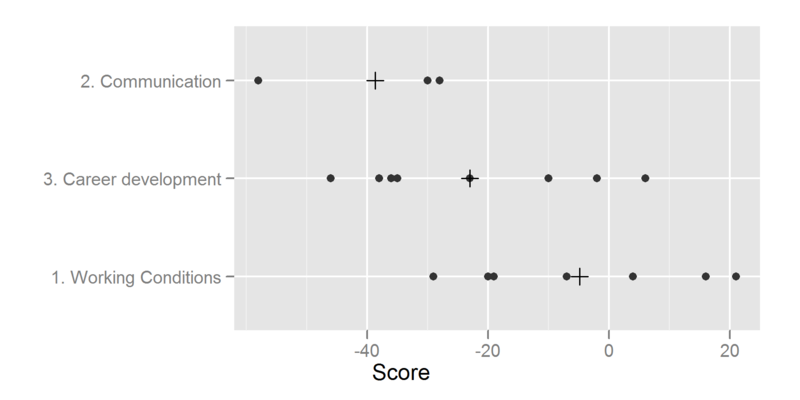 Now we visualise these scores as a dotplot. Here you can see that communication the biggest problem area. Which functions in R base call internal code? In a recent question on Stack Overflow about speeding up group-by operations, Marek wondered which functions called .Internal code (and consequently were fast). I was surprised to see that there appears to be no built-in way to check whether or not this is the case (though is.primitive is available for primitive functions). Writing such a function is quite straight forward. We simply examine the contents of the function body, and search for the string “.Internal” within it. You can retrieve all the functions in the base package with this one-liner taken from an example on the Filter help page. Now getting the list of functions that call internal code is easy. Variability of biomarkers in volunteer studies: The biological component, of which I am co-author, is now published in Toxicology letters. It’s a simple, straightforward look at calculating variability in half-lives of chemicals.